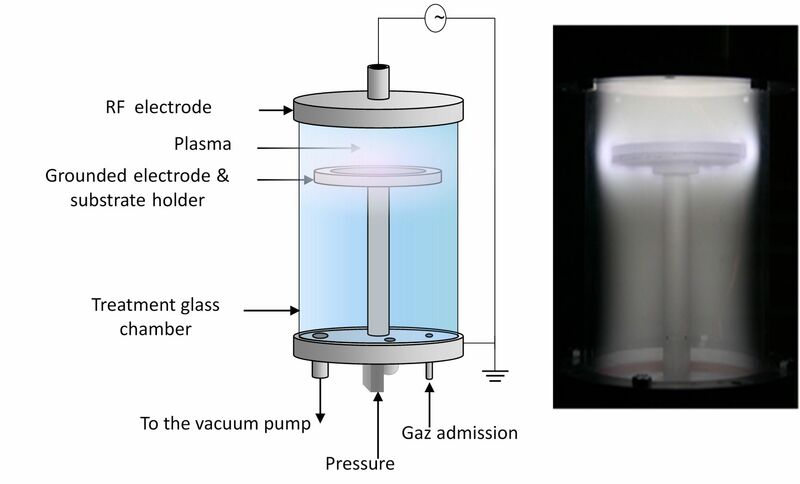 This system consist in a stainless steel cylindrical reaction chamber on which two separate plasma sources are mounted perpendicular one in respect to the other, as can be seen in Figure 1. 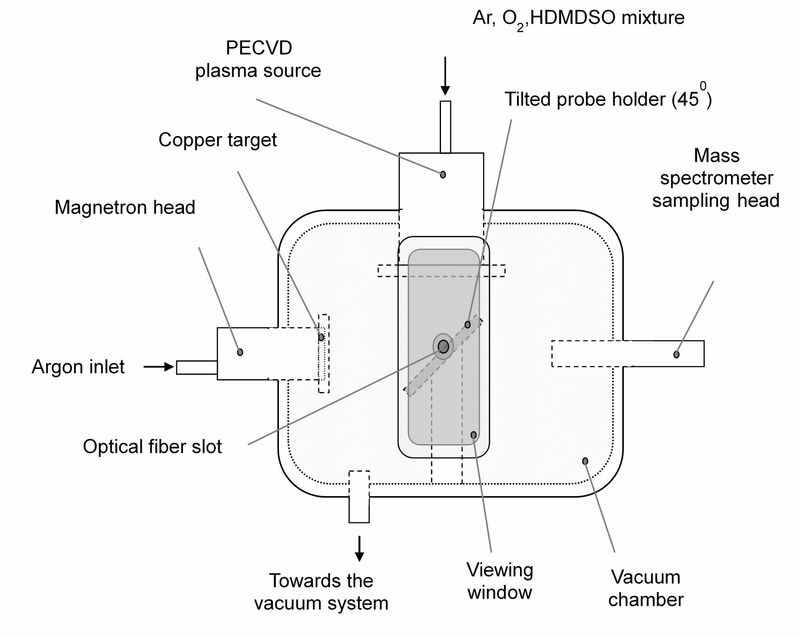 The RF powered electrode of the PECVD plasma source is constructed as a shower through which a controlled monomer flow is carried in vapour phase by an Ar flow. The magnetron sputtering source has a 2” Cu target mounted, which is sputtered by igniting a discharge in argon (various flow rate) at RF powers between 80 - 120 W, working pressure 0.07 mbar. This system is equiped with a mass spectrometer (EQP 1000, Hiden Analytical) which is mounted in front of the magnetron head, and an optical fiber which collects the plasma light on the entrance slit of a Horiba Jobin- Yvone HR spectrograph (grating 2400 mm-1) positioned perpendicular in respect with the mass spectrometer. This system consist in a cylindrical glass vacuum chamber which is evacuated down to 0.054 mbar base pressure by a rotary vacuum pump. The chamber is provided with two parallel aluminum electrodes, of 95 cm2 aria (upper electrode), respectively 57 cm2 aria (lower electrode), separated by 6 cm distance. The upper electrode is RF active while the lower one, which serves as substrate holder as well, is grounded. The plasma system is capacitively coupled to the radiofrequency generator (13.56 MHz) through an impedance matching unit. Liquids precursor are introduced into the reactor through a control, evaporator and mixing system (CEM, Bronkhorst) that combines a small and constant argon carrier flow with the vaporized monomer flow under constant temperature. Permeability control of porous polymeric membranes (TM), both by plasma deposition and plasma treatment.